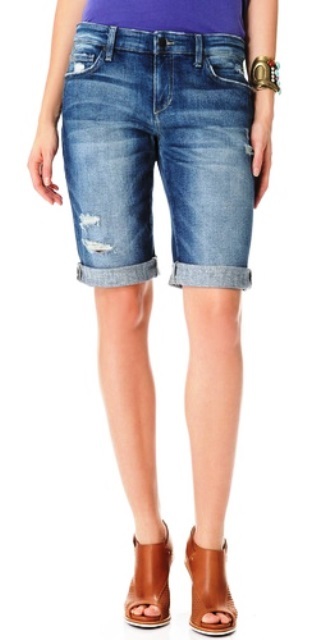 My hunt for the perfect fitting summer shorts is an ongoing one that seems to have lasted for years. Many of the styles that I'm drawn to never seem to fall right on my petite frame - when the waist fits right, then the back might look unflattering or the leg openings are too tight or boxy. Being that I didn't always fancy jeans/denim (I've always been a slacks kind of girl), I only have two pairs of jeans in my closet, so it's not like I could grab an old pair and create my own DIY cut-offs. Oddly enough, my aversion of ripped up jeans has suddenly turned into a strong attraction, as I like the rolled up cuffs, or even the un-cuffed styles this season. It might be because the trend seems to have stuck around a little longer that I thought it would. Then like anything else, it's all in the way you style an item and wearing the right style for your age. I definitely would feel much more comfortable wearing these Bermuda ones than the average short shorts where others could possibly see my tonsils. 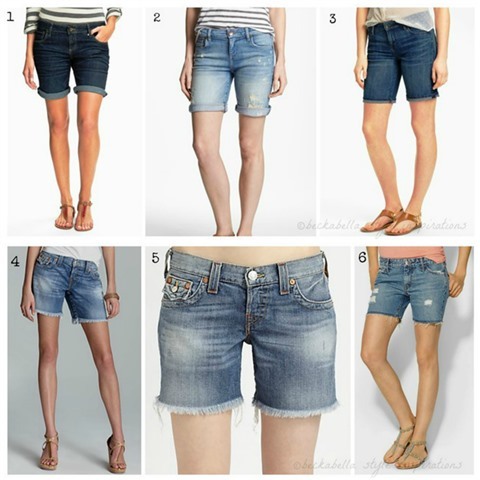 At the moment, I'm really liking the longer boyfriend style shorts cuffed and/or un-cuffed.